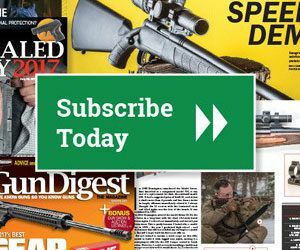 Win Gun Digest books, a Great Guns Daily Calendar and more! It’s a pen, made from a 50-cal cartridge! We may not be as popular as Oprah or Ellen (at least not yet), but we do have a few “favorite things,” and this month we’re giving away several of them! With the holidays coming, re-gifting is encouraged, but we’ll also understand if you decide to keep this great prize for yourself. You know the drill – To enter the random drawing, just post a comment below answering this question: Do you prefer your eggnog hot or cold? Or, as always, you can just say you’d like to win the giveaway. Entries will be accepted until midnight Wednesday (Dec. 12, 2012) and we’ll announce the winner Thursday (Dec. 13) in the Inside Gun Digest Books blog. Entries accepted until 11:59 pm Central Time Wednesday, December 12, 2012. Winner will be selected at random and announced Thursday, December 13, 2012. Did you see Monday’s Giveaway? Be sure to sign up for a chance to win the 2013 Standard Catalog of Firearms from earlier this week, and stay tuned for more giveaways over the next few weeks from the Inside Gun Digest Books blog! I also believe eggnog is best served cold. Cold is the only way I’ve had it. Awesome giveaway! What a great set! Please sign me up. I always drink mine cold,never tried it hot. Never had it hot…Hmmm. But I’ll take mine cold with rum please. Cold. I’m planning to try some of that cinnamon whiskey in it this year. Cold. It is hard to taste anything when your tastebuds are scalded. Cold! Thank you for the chance. I would like to win the giveaway. I like my eggnog cold. I would like and love to win the giveaway!! I’ve always had my ‘nog cold. I prefer my eggnog cold. Egg nog is only good if it is homemade and cold. I don’t like eggnog hot, cold, or with Baileys. Cool set. Would love to have it. I would have to say cold since I have never tried it hot. I’ve never even heard of hot eggnog! Cold for sure, with perhaps a little “enhancement”. I don’t think I’ve ever had eggnog! I like my eggnog cold… but not too cold. I prefer my egg nog cold. Cold, with Bourbon and nutmeg. My Birthday is on Christmas Day and as a kid I always got shorted on presents. Oh well. My eggnog — cold. My eggnog latte — hot. Cold… The colder the better, but I like a little something extra that warms up the belly. Eggnog is best cold but even better with “just a touch” of a good brandy. I don’t like egg nog at all, but cold if I must! Cold, never drink hot drinks. Not a fan of eggnog, but would probably go cold. forget the eggnog, bring me a real drink! And I would love to win this book to read as I imbibe. I prefer thick rich & creamy liquids cold. Hot eggnog would make me feel like I was churning butter in my tum-tum, which would make me a very unjolly camper. Also, I would love to win the limited edition gun digest collectors set!! My birthday is the 14th of December, & I’ll be a quarter of a century old!! Happy Birthday CTromblee, and good luck in the drawing! I never even heard of having eggnog hot. I’ve only ever had cold eggnog, so that is what I prefer, but I would like to try hot eggnog and see how I like it! Cold! Easier to chug before it gets into the raw egg danger zone temperature.